Naturally, now that I am in my final course of school, preparing to graduate, it is clearly going to be one of the most time-consuming courses I’ve taken so far. So much reading and writing that it won’t be funny, gang. Luckily, I’ll get one week off for Thanksgiving, but other than that, I don’t know if you’ll see me here or not over the next several weeks. After that, I will graduate and then have time to start going through all my belongings, throwing out what I don’t absolutely need, and then packing up all the rest of it, preparing for my next long-distance move. The trip to NYC last week got cancelled at the last minute, due to a death in the actress’s family down in D.C. I was disappointed, but soon enough, I will be back there permanently. For now, we are working on Skype until the airfares go back down again after the holidays. I know I keep telling you how excited I am to be working on this project, but I must say it once again: I am so excited to be working on this theater project!! Yesterday when we were Skyping, I found out that I already know the director (I never worked with him, but I lived in the same apartment building as he and his wife for many years.) And I know the stage manager — to put it mildly. It is my ex-husband! I said, “You’re kidding??!! Wayne is the stage manager?” He is perfectly suited to that role, btw, and he and I still get along really well, so, wow, what a cozy little group. The only people I don’t know yet are the music director and the agent who’s repping it. Between Skyping every Wednesday now with the actress, and Skyping every Saturday with Kevin (my writing partner in Brooklyn, on a different project), and this colossal ton of homework required for my final class, and my regular ton of part-time jobs… it leaves little brain-space for the re-writes of the TV pilot, but I still manage to squeeze it in. Even though all of this stuff is really exciting, it is stressful and leads to lack of sleep and to depression. I sure do wish I didn’t have to work quite so many part-time jobs. But the end is in sight. Soon enough I will be able to concentrate on my ministry and my writing — and my new/old relationship with my guy-friend back in New York. I just have to keep hanging in there. My depression is very low-grade at this point and I know that as things progress and change and end and new beginnings begin, the depression will evaporate. So, on that happy note, I’m gonna scoot and start reading the SEVENTEEN (!!!!) (yep — 17) chapters in my textbooks that I need to write papers on this weekend. Oh, btw, here’s my theme song! It gets me through. Give it a try, it might help you, too!! All righty!! See ya, gang. Thank you so much for visiting! 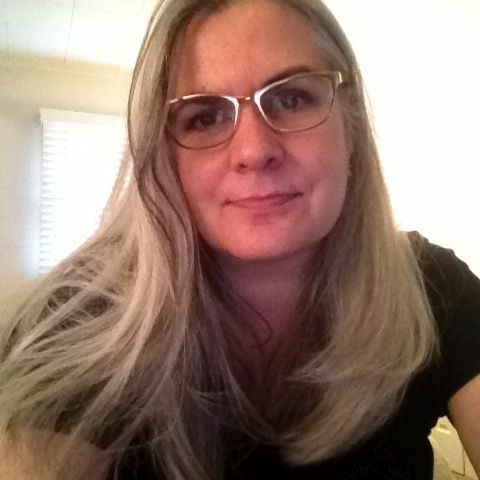 Here I am in my new Marilyn Monroe glasses. I’ve had them for a couple weeks already and I just LOVE them!! Me in my new Marilyn Monroe frames! 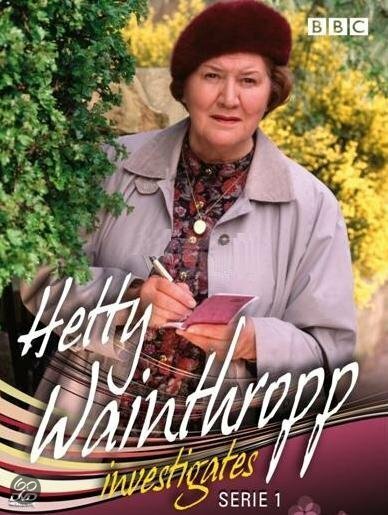 Then I switched to YouTube and watched several episodes of Hetty Wainthropp Investigates! I love Patricia Routledge and it’s refreshing to see her being clever and not being Hyacinth Bucket once in a while. 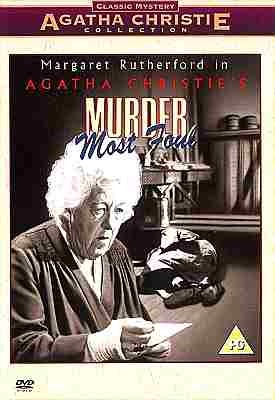 Which reminds me that another one of my favorite films is on tonight — on Turner Classic Movies: Dame Margaret Rutherford in Murder Most Foul!! I have to say that Dame Margaret had the strangest take on Miss Marple ever, but it is still really fun to watch her movies. She made 4 Miss Marple movies — this one is the one where she joins a local theatrical troupe in a small English village in order to, of course, solve a murder. It is really fun — made in England in 1964. 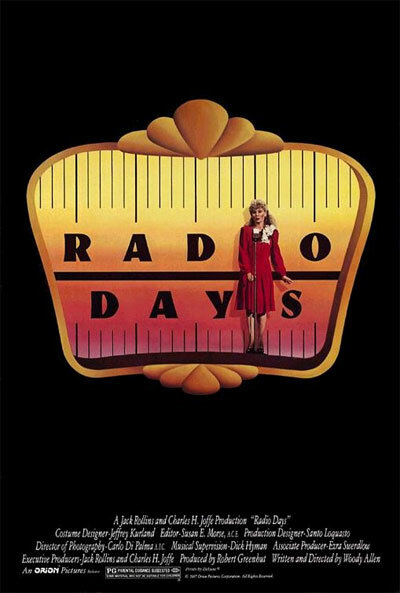 Even though I’m going to DVR this, I will probably stay up and watch it tonight, since tomorrow we set the clocks back anyway. I won’t miss any sleep. Although, I have to say, they get less feral all the time. Here is a shot of Weenie on my bed last night, while I was watching Hetty Wainthropp Investigates. He is very comfortable around me, although most of the time, he won’t let me pet him. He’s getting better about that, though. 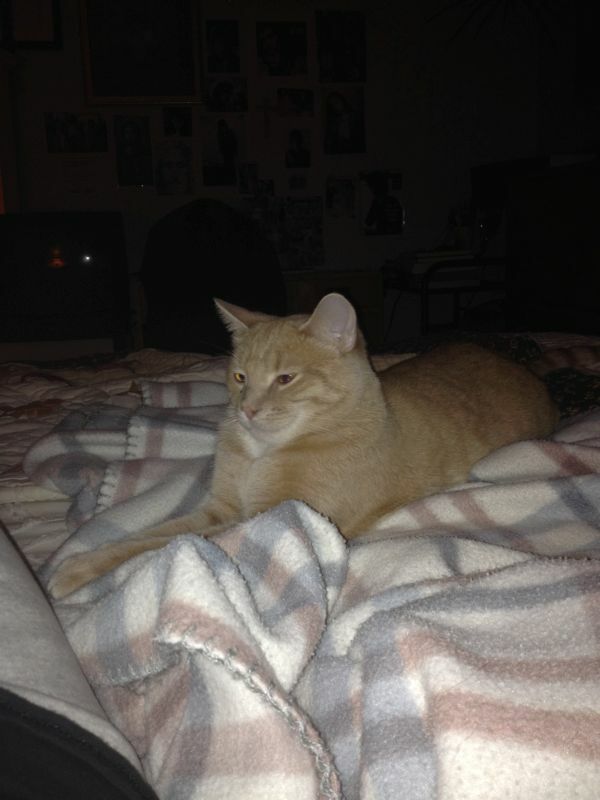 Weenie, relaxing on my bed last night! Okay, I guess I better close this and start working. I’m going to make a pot of butternut squash soup (the easiest soup ever — boil the squash, an onion, celery and a carrot, 4 small peeled potatoes, sea salt and a dash of red pepper flakes for about 30 minutes, then puree it! ), finish the laundry, then get crackin’ on all that homework. Have a wonderful (meaningful?) All Soul’s Day, wherever you are, gang! Thanks for visiting. See ya!